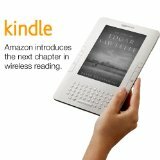 Earlier this year I bought an Amazon Kindle reading device, and I want to share my impressions of it so far. I ordered the original Kindle in January, but I was informed it was backordered and wouldn’t ship for 2 months. A month or so later, Amazon informed me that they were about to release the Kindle 2, so they automatically upgraded my order for free, and I received the Kindle 2 shortly thereafter. I’ve had a few months to play with it now, and overall I like it a lot. The Kindle doesn’t use an LCD screen. It uses a special technology called electronic ink. This involves shifting around physical particles to form each pixel instead of turning on tiny lights. This means that the Kindle isn’t back-lit, so you won’t be able to read it in the dark without another light source. In practice this isn’t a big deal because it’s no different than reading a print book. I thought the e-ink was pretty amazing when I first saw it. The text is very crisp and easy on the eyes. When my Kindle arrived in the mail, I noticed there was some text printed on the screen. I assumed it was one of those plastic stick-on sheets to protect the screen from scratches during shipping, as you often find on electronic devices. However, when I tried to peel off the sticker, I discovered there was no sticker, and I got confused. Was this a piece of plastic I had to snap off somehow to get to the real screen underneath? It took me a while to figure out that the device was already turned on and displaying a welcome message. The text was so unlike what I’ve seen on an LCD screen that I didn’t realize it was being displayed by the device itself. The Kindle 1 received many complaints about the page turning buttons, which were too easy to bump by accident. The Kindle 2 solves this problem definitively by making the buttons hinge from the outside in, so you have to press them on the inside edge. That’s easy to do intentionally but hard to do accidentally. I like that there are duplicate “Next Page” buttons on the left and right sides of the Kindle. This makes it easy to keep reading while holding the book in either hand. My #1 gripe with the Kindle 2 is the slow page turning. It’s faster than the Kindle 1, and it only takes about a second, but those seconds add up when you’re seeing only a couple paragraphs per screen. You can change the text size very easily. I only use the two smallest sizes. Even at those sizes, you’re only seeing 2-3 paragraphs at a time. At the largest size, you’ll see about 50-60 words per screen. The search feature is very fast. You can search through individual books or across all the books in your collection. I wish I could instantly search through all the print books on my bookshelf since that would be incredibly useful. As I add more books to my Kindle, the search feature will become more valuable. Battery life is excellent. I’m very impressed with that aspect. The battery drains faster with the wireless turned on, but it can last for a couple weeks if you keep the wireless off and just turn it on when you need it. It only takes about 15 seconds for the wireless connection to boot up once you enable it, so I usually leave it turned off. Even so, you’ll still get many hours of use with the wireless turned on. I like the innovative power cord and USB port which share the same jack and cable. The cable has an attachment on the end to turn it from a USB connection to a regular power plug. There’s a charging indicator light that is yellow while the Kindle is charging and turns green when it’s fully charged. Unfortunately since I’m color blind, I can’t tell the difference between those colors. That lame design decision makes this feature worthless for me and the millions of people who see colors like I do. Fortunately it doesn’t matter much because the device only takes hours to charge completely, and the long battery life means I don’t have to charge it more than once every few weeks, even if I’m using it a lot. My iPod tells me on the display when it’s fully charged. I love the wireless connection to Amazon.com’s online store. It’s really nice shopping for books this way, especially since I’m used to buying items from them. You really can purchase and download books in less than 60 seconds. The first book I bought took 35 seconds to receive. And the best part was that I bought it from my backyard. The Kindle accesses a 3G wireless network directly from the device, just like a cell phone, so you can shop for books from just about anywhere — no need for a WiFi connection. When shopping online you can access essentially the same info about a book that you can get at Amazon.com, including the reviews that people have posted. The downside is that you can’t see as much info on the screen at any one time, so it takes longer to page through lengthy text. I like to scan through multiple reviews very quickly, and that’s harder to do on the Kindle. You can make annotations throughout any book you read, and then you can review the annotations later. I haven’t used this feature much, but it could come in handy if I read a book with a lot of sections I want to highlight, such as for posting a book review. Amazon backs up your purchases as well as your annotations, so you can download them again later if you buy a new Kindle-compatible device. I like that all the books I buy for my Kindle can be accessed indefinitely as long as I have a device that can read them. Some people might not like being locked into a proprietary system though since you can’t read Kindle books on other ebook readers. Personally this doesn’t bother me since Amazon is the only online bookstore I patronize anyway, other than buying ebooks now and then. I’d probably be very concerned right now if I were one of their competitors. You can subscribe to magazines and blogs on the Kindle for a small fee. Each blog is 99 cents per month, and you can get a free 14-day trial. The latest content is automatically downloaded to your Kindle via the blog’s RSS feed. But not all blogs are available because the blog publisher must explicitly submit their blog to Kindle and agree to Amazon’s long list of terms. There were about 1000 blogs listed last time I checked, but I haven’t checked for months, so there are probably a lot more by now. Personally I don’t use this feature at all, but that’s probably because I don’t regularly read blogs. I also thought the selection of blogs on the Kindle was pretty weak. Despite several requests I’ve received from readers to make my blog available on the Kindle, I won’t be doing so anytime soon because Amazon’s Terms of Service for bloggers are too draconian for me. I might make a little extra money from the subscriptions, but it isn’t worth the headache to change the way I blog just to satisfy their requirements. Many other bloggers will balk at those terms as well, so I think the availability of the most popular blogs on the Kindle will be rather limited if they stick to their current terms. But perhaps they’re deliberately trying to start out slow so they don’t get overwhelmed with submissions. Personally I think it would be to Amazon’s advantage to lighten up their terms and not be so controlling. It seems silly to hold blogs to a different standard than the books they sell. Sometimes the Kindle version of books don’t include everything the print version does. Recently I read the book Wired for War: The Robotics Revolution and Conflict in the 21st Century by P. W. Singer on my Kindle. I received the book in less than 20 seconds after ordering it directly from the device. Yesterday I was in a local bookstore and happened to see the hardcover version on the shelf. I thumbed through it and noticed it included several pages of photos on glossy paper. I didn’t receive any of those photos with the Kindle version. I don’t see why the photos weren’t included. They were all in black and white anyway, and the Kindle is capable of showing photos in 16-color grayscale, which would have been adequate to display the ones from the book. Incidentally, this was an excellent book — highly recommended if you’re curious about the future of robotics and unmanned combat. Did you know there are now thousands of robots now on active combat duty in the Middle East, many of which are armed? The Kindle also includes some experimental features. Text-to-speech allows you to have your Kindle read any text to you. The Kindle comes with built-in speakers as well as a headphone jack. You can choose from male and female voices and different reading speeds. This is a nice touch, but personally I never use it. The Kindle is a bit too bulky to make a good portable listening device, so I’d rather listen to audio programs on my iPod. Nevertheless, this could be a useful feature under certain circumstances. For example, if you’re going on a long road trip and reading in the car makes you carsick, you can listen to your books on the road and then continue reading normally once you arrive at your destination. Same goes for plane travel. You can also set your Kindle down on the counter and have it read your latest book to you while you make dinner. You can play MP3s from your Kindle, uploading them via USB. I haven’t tried this because I’d rather use my iPod for audio. You can surf the web in a limited fashion, much like you would on a cell phone. I was able to check my Gmail account with it, but it’s pretty tedious due to the slow speed. The web browsing feature crashed on me a few times as well. I like that they included this feature, and I found it useful during a trip to L.A. when I didn’t bring my laptop, but realistically I’d only use it in a pinch if I had nothing else available. So far I really like my Kindle, and it has quickly become one of my favorite gadgets. But I’d still like to see the technology improve, especially the overall speed of the device. The Kindle reminds me of the pads from Star Trek: The Next Generation. When I use the thing, I feel like Wesley Crusher reviewing engineering schematics in Ten Forward. I mean that in a good way. I know this tech is still evolving, but I already get the sense that we’re on the cusp of a major transformation. I feel I’m witnessing the future of reading when I use my Kindle. As I sit in my office right now, I’m staring at hundreds of print books on my bookshelves and thinking, your days are numbered. And that includes my own book (which by the way does have a Kindle version and is currently in the top 1% of Kindle books by sales rank). By far my favorite aspect of using the Kindle is the shareware marketing element coupled with the instant gratification. When I go to a bookstore, I like to browse books on the shelf. I’ll often read a chapter right there in the store to decide whether the book is worth my time and money. But many times they don’t carry the book I want, or they have a weak selection on the topic that interests me. And then I may have to wait in line to buy, especially during the holiday season. When I shop online, I get a bigger selection and better prices, but I have to wait days for my order to arrive. Even with the Amazon Prime program, which gives me free two-day shipping on every order for $79 per year, I still have to wait two days or pay extra for overnight shipping. That’s too long if I find a book I want on a Saturday morning and would like to read the whole book that weekend. I’m used to finishing books within a day or two after I buy them. With my Kindle I get the best of both worlds. I can shop online with a vast selection since almost 300,000 books are now available on Kindle. When I find a book I like, I can instantly download a free sample chapter and start reading immediately. Then if I like it, I can buy the full book right away, usually for $9.99 or less. This whole process is superb. It’s not perfect — I still love to be able to thumb through the entire book like I can in a bookstore — but it’s a huge step in the right direction. The Kindle also eliminates the hassle of shelving print books in my home. Erin and I own hundreds of books, and they take up a lot of space. I can donate the ones I don’t need to keep, but I still want many of them available for reference. The Kindle makes this very easy because it can hold up to 1500 books on the device itself. I think it would be especially cool if Amazon gave you the Kindle version when you bought the physical version of a book too. It would also be nice to get Kindle versions of the print books I’ve already bought from Amazon over the years. They certainly have that info in their database. I understand if they can’t do this for free, but maybe they could offer a deep discount on the Kindle price for books they can verify that you already own, like 99 cents or so. If I could instantly Kindle-ize all the Amazon books I’ve bought over the years for 99 cents each, I’d very likely do it. But $10 each is a bit too much. This problem of digital rights management isn’t specific to Kindle — you see it with music, movies, and software too — but I think Amazon is in a good position to offer better solutions so you don’t have to keep buying the same content in different media forms. For someone like me who buys dozens of books each year (despite being sent so many for free), the Kindle is likely to save me money in the long run, even with the $359 price tag. Most Kindle books are $9.99. For the types of books I frequently buy, I probably save about $5 per book on average, so with 72 books I recoup my Kindle investment. The money isn’t a big deal to me, but I point this out because I know that some people would consider this a pricey gadget. The price may be offset partially or completely if you buy a lot of books. My kids got curious about my Kindle when they saw me reading it. Since it doesn’t look like a book, I think they regard it as something of a toy, like a Nintendo DS. My daughter Emily (age 9) keeps calling it a kettle. I showed her how it works, but she didn’t seem to care much. She loves to read as well, so I may have her read a book on the Kindle to see if she likes it. If some of her favorite authors are available on Kindle, she may quite enjoy it. This would save us from having to store all the books she buys. This summer Amazon is releasing their new Kindle DX, which is currently available for pre-order. Compared to the Kindle 2, the Kindle DX is significantly larger (10.4″ x 7.2″ x 0.38″). It has a bigger screen (9.7″ diagonal compared to the 6″ Kindle 2 screen). It has more memory (4GB, enough to hold 3500 books compared to the 1500 books on the Kindle 2). And it costs more ($489 vs. $359 for the Kindle 2). It also has some new features like native PDF support. At 10.2 ounces, the weight of the Kindle 2 is just right, roughly comparable to a paperback book. The Kindle DX weights 18.9 ounces, so that’s more than a pound and 85% heavier than the Kindle 2. By comparison, however, the last Harry Potter book in hardcover weighs 41.2 ounces, so the Kindle DX is less than half of that. Even so, the heavier weight may mean more wrist strain if you like the device with one hand at an angle like I do. I’m not sure if I’ll get a Kindle DX. I’d probably get one only if Erin and the kids end up taking an interest in my Kindle 2, and we end up competing for who gets to use it. Then I might buy a Kindle DX, so we have a couple devices to share between us. This would allow us to share all the books bought across both devices if we link them to the same Amazon account. At present I’m quite happy with my Kindle 2 though, and I’m glad I bought it. I hope that in time the price will come down, so these devices can be accessible to a lot more people, including those who don’t read as often. I would not want to be the owner of a brick and mortar bookstore right now.